Our Pre-Varnished Redwood comes ready-sanded and varnished for instant fitting. Harmful fumes from the application of chemicals such as lacquers are also eliminated. Our Redwood Pine Chamfered Skirting Board packs come with (5x2.4m) lengths per p..
Our Redwood Pine Ogee Skirting Board packs come with (5x2.4m) lengths per pack. 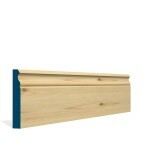 ..
Our Redwood Pine Torus Skirting Board packs come with 5x2.4m lengths per pack. Free D..